How Do Eye Shapes Affect The Way Makeup Looks On You? A Million Eye Shapes: Which do You Fall Under? Eye shapes vary as much as there are eyes on women's faces. Here you will find a run-down of basic shapes, and eye makeup guides for the most common ones. We may not be aware when passing judgement on others based on their facial features, but we all do it. This is because nature has given us indicators to assess others. You might call it intuition, just a feeling,... or whatever you think is making you feel a certain way about someone. Your assessment helps you to make decisions about how to interact with them. This has to be based on the little information you get from their appearance if you don't know them well. As with all other facial attributes, makeup can be used to make the best of what nature has awarded you. You can also alter certain opinions about yourself that may be based on your looks. To say one feature is more attractive than the other would be wrong. This is because the beauty of a face is determined by the interaction of many different variables. Aspects that work together to create the masterpiece that is you. There are a few basic classifications that vary according to various eye attributes. Your eyes can display one of these attributes, or a combination. We will be looking at the main contributors to different shapes. These are spacing, size, the eyeball's position in the eye sockets, position of the lids, and linear shapes. The point of knowing the science of a beautiful face though, is just to be able to improve or alter your appearance(without permanently disfiguring) your face. Working with the goal of either enhancing our positive traits, or creating symmetry in mind, lets begin. Are you curious about your eye shape and the message that they send out? You can now figure it out in our eye shapes quiz. To determine which eye shape spacing category you might fall into, look at the space in between your eyes. If the space is smaller than the length of one eye, you have close set eyes. If its wider, your have wide set eyes. Based on ancient Chinese face reading technique, the distance between your eyes indicates your attitude towards detail. People with wide set eyes are apparently more about the bigger picture, while those with close set eyes pay more attention to detail. 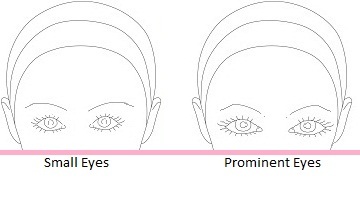 These eyes are considered to have the most balance and symmetry. 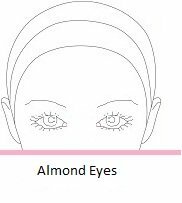 From a make up perspective, almond eyes will look good with any type of make up look. Whether you want to go smokey all over, or highlight just a certain area of the eye. Small eyes are exactly that. Small. Unfortunately, that’s where my own eyes fall, ahem… but nevertheless, they are still beautiful and can even be gorgeous. These two shapes are often confused, especially when someone has big, beautiful eyes. Protruding eyes can be big or small, and are comparable to chameleon eyes. They stick out of their sockets and so create deep shadows that are mostly noticeably created by the lower eyelid. 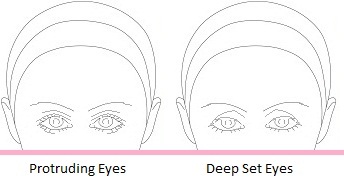 The top eyelid doesn't create shadows like those of people with deep set eyes. Those with these kinds of eyes are said to be energetic! The type of person who is always more comfortable if they're part of the action. Deep set eyes on the other hand, are sunken into the eye sockets. Their main characteristic is the deep shadow created by the eyelids above the eye... So if you're confused as to which position your eyeball's are in, just look at the top lid and not the bottom lid. Hooded eyes have a flap over the eyelid. So basically, the space from the eyebrow to the eyelid seems like one, because the eyelid droops. A lot of Chinese people have this type of eye shape. I find these eye shapes quite alluring, as if there's so much more to know about that particular person than you see... I know, the picture above doesn't do the eyes justice! 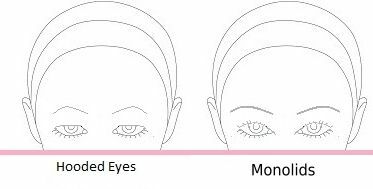 Monolids are similar to hooded eyes with one huge difference. You can see most of the lid, all the time. When eyes are hooded, they fold over the lid. When you have a monolid, the fold is over just the lashline. 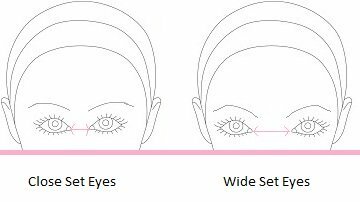 The linear shape of your eye is that actual description of the lines created by your upper and lower lash line. Round eyes are made by two curves, with a more pronounced, curved lower lash line. Actually, round eyes aren't exclusive of phoenix and puppy eye properties, because you can still have the outer corners high up, or a little lower. Then phoenix eyes are slanted upwards. They're basically cat eyes that can be rounded or flat. Their 'opposite', are downturned puppy eyes. They slant downwards and give you that cute puppy look. If people stop you in the street and just want to cuddle you... then you know...:) Okay maybe they won't- but you probably get the feeling that they want to! With so many eye shape categories to be in, It makes it easier to know the best way to place colors, liner, and mascara. You have no excuse not to look your best when you need to:)!